The Ogura ORC19DF battery powered hydraulic rebar cutters feature amongst the extensive range of both cordless battery powered and electric tools available for rebar cutting and rebar bending offered by Stainelec Hydraulic Equipment . The high power of these unique rebar cutting tools allows users to cut 20 mm rebar easily.The unique cutter head can rotate 360° for awkward site locations to cut rebar on a job site. 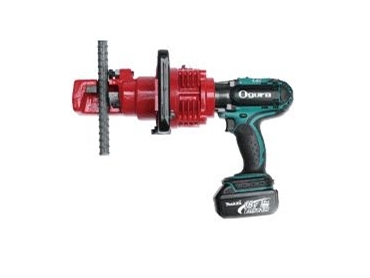 The Ogura ORC19DF battery powered hydraulic rebar cutters are powered by world famous “Makita” brand Lithium Ion 18 volt batteries and motor. Dimensions L x W x H: 430 x 281 x 126mm.